When my Cape Wrath Trail plans didn’t work out I had to make a decision about where to go next. I wasn’t planning on doing the Great Glen Way at all – so I had no trail description or any notes. 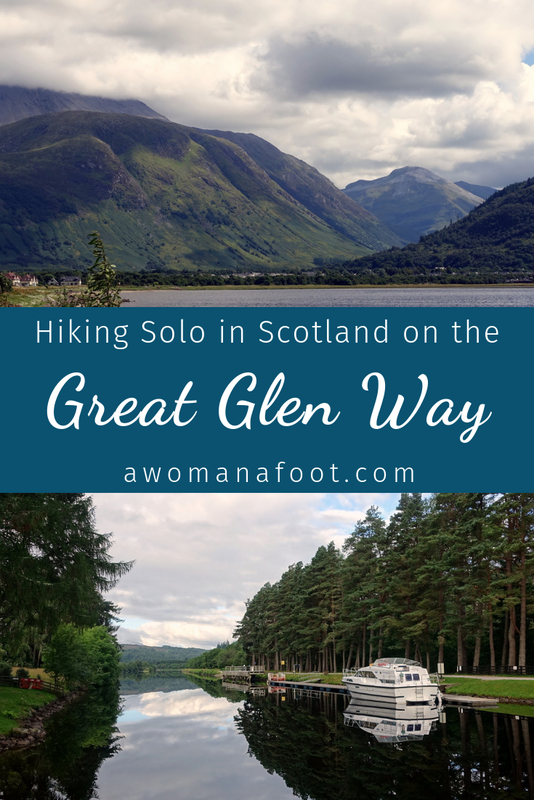 When I was preparing for my Scottish adventure I copied to my Kindle a lot of trails (planned and potential) descriptions, but somehow I didn’t even think of including the Great Glen Way. When I was in Glenfinnan I did some hard thinking and decided that taking on a lighter trail before the more challenging Skye Trail would be a good idea. The Great Glen Way is a 117 km long coast to coast path through the Highlands. The route follows the natural fault line of the Great Glen. It takes you along the whole lengths of Loch Lochy, Loch Oich, and Loch Ness as well as the Caledonian Canal that links them. Most of it runs on low levels with just some recently added options taking you higher. It is considered an introductory trail to the Highlands and to the long-distance trekking. It is also the perfect trail for solo and budget hiking - it is very well marked, safe and with enough places to camp overnight. The Great Glen (An Gleann Mòr) follows the geological fault and used to serve a very important strategic role in controlling the Scottish clans – hence the militarized towns: Fort William, Fort Augustus, and Fort George. The Caledonian Canal was an engineering marvel created by the great mind of Thomas Telford in the beginning of the 19th century. The 22 mile-long man-made section with 29 locks opened in 1822 after 12 years of construction, costing twice what was expected. It was heavily used for many decades. In 2005 it opened again after ten years of major restoration works. It is now used for commerce and leisure attracting many tourists. People come here to walk, run, cycle and paddle along the Canal or rent one of the many vacation houses along the shores. My original plan was to walk all the way to Inverness and then take a bus to the Isle of Skye. But I didn’t make it – my Great Glen adventure finished in Fort Augustus. Can I be totally honest with you? I found it somewhat boring and wanted to move on to the rough landscapes of Skye. If I had more time I probably would have finished the trek, alas – I had to prioritize. On the first day, I returned in the morning from Glenfinnan, got some grocery, used the train station's Wi-Fi and moved on. It was an absolutely beautiful and hot summer day, but the trail is hard. Literally – it takes you through Fort William suburbia and along the canal – no wild paths, pure pavement everywhere. The highlight was definitely the view from Caol, though (check the first photo above). I took a break there, ate some snacks and just enjoyed the view. Ben Nevis looked majestic rising beyond Loch Linhe. Later the very well-marked trail runs along the Canal towpath soon reaching the famous Neptune’s Staircase. Walking along it makes you ponder at the engineering genius of Thomas Telford. As an additional perk, by chance, I saw again the Jacobite’s passing by in Banavie. My nerdy nature was happy and for a moment I even forgot the pain of hard-surface walking. A piece of advice – it is worth renting a key (for £10) from the Canal Office. There are a number of toilets and showers along the canal that you can access with the key – seriously worth it! You just give it back at the end of the trail. They also give you a map with clearly marked spots with toilets, showers or designated wild camping areas. The services were created mostly for the on-water canal users, but there is no prohibition for walkers to benefit from it. I reached Moy Bridge which has a dedicated wild camping area and decided to call it a day. My feet hurt badly from the hard surface and I needed some rest. The Moy Swing Bridge itself is really cool – the person who operates it by hand has to first open one side, and then go by boat to the opposite shore to open the other side. I was watching a few times the procedure and was fascinated by it. In our time of technology to see that this person has to do everything manually was mind-blowing. Take a look below at some great picks in hiking clothes for women, perfect for hiking in Scotland! The weather wasn’t as nice as the previous day – it was raining already during the night although stopped long enough in the morning to pack the tent with no issues. Last night I had a company – a great guy from Germany, Marcus, with whom I camped for the next three nights. We had a great time talking for hours! It’s a pity I didn’t get any form of contact with him, as I would love to stay in touch. My wild camping at Moy Bridge had one big downside – no toilet or other facilities. So the next day I walked to Gairlochy to use my magic key. The facilities were great: big shower room with enough space to leave my backpack, so I took a shower with hot water and felt much better right away. The trail itself left the towpath for a while and lead among trees, which was a nice change. The weather (constant light rain) didn’t help much with appreciating it, though. I felt tired and the backpack was too heavy after resupplying in Fort William. My plan for the day was to get to Laggan – but I didn’t make it. I chose to wild camp at a dedicated spot at Glas-dhoire where there was a compost-WC. Again – only accessible with the magic key. It's a tiny spot - for two tents only. I saw there was someone else camping some hundred meters down the shore, among the trees, though. The view over the loch was beautiful! But it got cold and the midges attacked us with some serious vengeance! I hid earlier than needed in my tent to read and rest. I slept really well that night! ... and that's why I love wild camping! My beloved partners-in-crime: Salomon Quest 4 D best female hiking boots. I realized that my head net was more for mosquitoes than midges – those tiny bastards were getting through it! Marcus’s net was really fine and blocked those little monsters. The next morning I enjoyed my coffee with a view… it was gloomy with low hanging mist over the hills. Sometimes when I hike and feel tired and ache all over, I ask myself: "Why am I doing this to myself?". In the morning I was lucky to pack just before the rain started. My phone’s battery was very low and I wanted to find Wi-Fi to let my loved ones know I’m OK. I went off the trail to find a café which was marked on a map – and didn’t find any. Made a few extra kilometers that way and was really annoyed. I was surprised that I had no issues like that along the West Highland Way - as it is a way more popular trail there is more accommodation close by. The trail itself was nice – it took you up and down in forests with some changing vistas. Unfortunately, my feet and knees hurt – I am pretty sure it was all because of the first day hard surface walking. I wild camped at Kytra Lock, which has a designated wild camping site. I was in bad luck, however – the compost-WC was closed. Marcus was first at the place and we later found out that we were not supposed to pitch the tent at that particular spot – the camping area was a bit deeper in among the trees. But we promised the lock-keeper to leave no trace. My plan for the next day was to only walk to Fort Augustus and make it a short day to rest, do some laundry etc. and then move on. But in the morning (after again talking with Marcus for hours) I decided to quit the trail and move on to the Isle of Skye much faster! I had to figure out what was more important to me: complete the trail or spend more time on Skye. I craved the more wild and rugged landscapes that Skye was to offer me, so the decision was simple. Fort Augustus is a really cute little town. There are plenty of places to eat something; there are tourist information and a bust stop. In the tourist information, I bought tickets to Portree. I highly recommend buying tickets ahead of time and you can do it in every tourist information office. On my last day going from Broadford to Glasgow I had a ticket I got the day before… Lucky me – there were people turned away because of lack of seats! I’m glad I did those few days along the Great Glen Way, even if I didn’t finish the trail. I could get a glimpse of the landscapes and see the famous canal. If I was to do it again, I think I would skip parts of the first day – what a killer for the feet and knees! Inverness is still on my list of places to see, though. I might go one day and walk it the other direction, starting in Inverness. It was a bit rude of me not to say 'hello' to Nessie, right? Another reason to get back to Scotland! FYI - All the photos you can see in this post were taken with my beloved camera: Sony xr100m3 - best camera for hikers and backpackers. Check out my review to find out why I love it so! Have you ever hiked in the Great Glen? How was it?